The Atomic Super men mentioned by the Professor appear in "Time Keeps on Slippin'"
Matt Groening: So Gregg do you want to talk about this Opening Sequence? [Pauses for answer.] I guess not. Patric M. Verrone: He said adverts on bananas which ABC threatened to do! 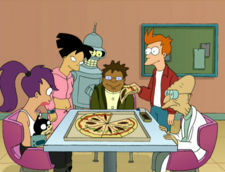 Gregg Vanzo: Fry was meant to buy another robot friend called Deluxor. David X. Cohen: We have the largest number a gasps than any show in TV history. This page was last edited on 5 May 2010, at 01:07.